KLCI may rebound on easing oil prices. Market may stage a mild technical rebound as oil prices ease after hitting above US$100/barrel. 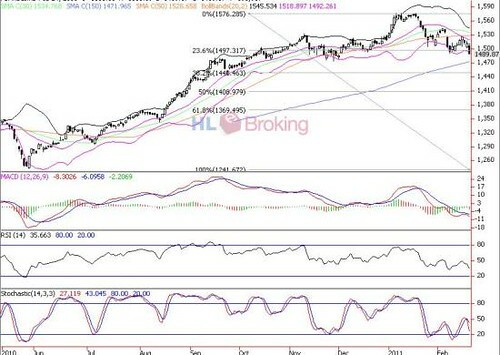 In line with the sluggish regional bourses, following another overnight 0.9% plunge on Dow amid escalating crude oil prices, the FBM KLCI tumbled 1.4% to 1489.9 on heavy selldown on bluechips and lower liners. Trading volume increased to 2 billion shares worth RM2.62 billion as compared to Wednesday’s 1.7 billion shares worth RM2.05 billion on renewed foreign liquidation, reflected by rising daily participation by foreigners to around 26% and weakening RM against greenback (the lowest since January 12). Market breadth was negative with 116 gainers vs 863 losers. In the short term, the local bourse will experience more wild swings ahead on renewed foreign liquidations and investors are taking a wait-and-see approach with regards to the ongoing crisis in Mideast. psychological level and lower Bollinger band. recovery at a later stage. Lower support levels now are situated around 1474 (3Month low) and 1448 (38.2% FR) whilst immediate resistance levels are 1500, 1519 (mid Bollinger band) and 1528 (50-d SMA).